Regional forum on the opportunities for EU funding for Bulgaria's Southeastern Planning Region opened under the patronage of Foreign Minister Solomon Passy. Attending are Finance Minister Milen Velchev, Deputy Regional Development Minister Hassan Hassan, MPs of the ruling Simeon II National Movement and the Movement for Rights and Freedoms, district governors and mayors. 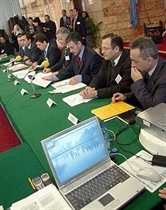 "Sega" reports a secret meeting of members of the incumbent political majority with the Prime Minister, who discussed legislation concerning the judiciary and the media. MRF Leader Dogan has urged the Prime Minister to admit again <?xml:namespace prefix = st1 ns = "urn:schemas-microsoft-com:office:smarttags" />Turkey's Koc in the privatization procedure for the Bulgarian telecom, "Monitor" writes. The source of this information is a "government minister speaking on condition of anonymity," and the item is headlined: "US$ 5 Million for MRF If Koc Buys BTC." The reputation of the Bulgarian Government has been marred by political contradictions which have emerged in the context of the privatization of strategically important enterprises, and this discourages potential investors, according to a Bank Austria report quoted in "Pari." Turkish-based Sisecam may begin building a plant in the Danubian city of Rousse in June, Turkish Ambassador Haydar Berk has said, as quoted in the dailies. The investor is planning to put some 100 million US dollars in the venture and to create 200-300 jobs, the Ambassador is quoted as saying. Turkey wants to terminate the agreement on electricity imports from Bulgaria, "Standart News" reports, quoting a Turkish newspaper. Turkey will have to pay 4.5 million dollars a month in indemnity if it suspends electricity supplies from this country, "Sega" notes. Balkan Air Tour, "Dnevnik" writes. Theirs were the only bids for the job, "Pari" says. OTP can acquire DSK Bank, Finance Minister Milen Velchev says, quoted in "Troud." According to Velchev, the contract price offered for DSK Bank is not the most important consideration, "Standart News" writes. "The highest bidder will not necessarily be the winning bidder. We will also consider other factors," Velchev says, quoted in "Standart News."